1 – When did Apogee first start? How have your original goals as a publisher shifted since you started, if at all? And what have you learned through the process? We started in 1999 because we thought there was too much quality poetry that wasn’t finding a home. We still think that. There are lots of quality presses but there are many, many more quality poets. So our motivation remains the same. What we’ve learned has to do with the process of bringing the book in the world—stuff that’s of interest to publishers but not to anyone else. See above. There was so much wonderful poetry to publish. For us a small press is and should be different from a big press. We don’t want to get bigger; we want to do things in an old-fashioned, hands-on way. We want to create a home for work that would be overlooked by bigger presses for whatever reason. 4– What do you see your press doing that no one else is? I don’t think we’re that unique. There are lots of small presses that are doing terrific work. I wish there were more—there’s plenty of that work to be done. 5– What do you see as the most effective way to get new books out into the world? I actually think the poet is the key. The poet’s desire and ability to read and interact will get the book out. We can help, of course, but in reality the poet will be the important person in getting the book into the world. When we accept a book, it’s accepted unconditionally. The poet doesn’t have to change anything. Then we suggest changes. Sometimes big changes, sometimes small changes. The poet can either accept them, or not. We distribute through Small Press Distribution in Berkeley. They’re absolutely essential; we would not exist without them. Our usual print run is 500 copies. We reprint if we sell out. Currently the three people working at the press are my press partner Alice Jones, our Associate, Sharon Osmond, and me. I should say that I consist of me plus my wife, the poet Valerie Coulton, but not necessarily in that order. Editing has made me open to a broader range of influences and has made me more flexible as a writer. Editing has made me a better writer. Alice and I have both done books with the press. When you publish books, it’s hard to cede control to someone else in the publication of your own text. We’re aware of the risks, of course. The main one is that you might really embarrass yourself. Hopefully we can keep each other honest. 11 – How do you see Apogee evolving? The press will evolve as we find new poets who are doing new things. Luckily, that happens all the time. As a publisher I’m equally proud of each of our publications. I don’t know that anything in particular has been overlooked. My biggest frustration is that we pass on so many wonderful books because of lack of resources and that there aren’t enough presses to publish all of those books. Too many to list. But certain early pioneers, for example, City Lights, or Cid Corman’s magazine Origin have to be named. And of course Burning Deck. 14 – How does Apogee work to engage with your immediate literary community, and community at large? What journals or presses do you see Apogee in dialogue with? How important do you see those dialogues, those conversations? Apogee’s work comes out of the immediate literary community. We’re in dialogue with more journals and presses than I can list, and even than I’m aware of because those journals support our poets without us necessarily knowing about. It’s the journals that create the dialogue initially, and they’re absolutely essential to us and to the poets. We try to hold at least one launch for each new book. Readings are essential and our poets read a lot. We have a website, of course. The press is in Berkeley and I live in Barcelona and those two things wouldn’t both be possible without the internet. You should query us before submitting. We aren’t looking for work that a larger, more conventional press would publish. Other than that we’re looking for surprises, so we don’t know what we’re looking for. Our most recent title is Table Alphabetical of Hard Words by Pattie McCarthy. Pattie’s unique interest in the intricacies of language, and especially the history of language, coupled with her interest in all aspects of everyday life—babies, the subway, little league no hitters, the Mets—make her a compelling and unique poet. Our most recent book before that was Elizabeth Robinson’s Also Known As. 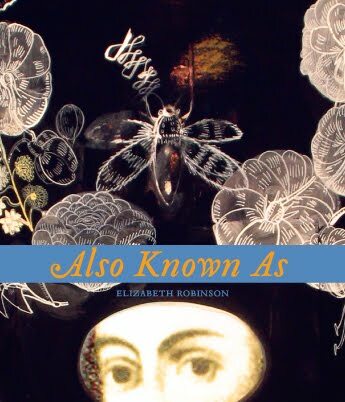 Elizabeth’s books are always different from each other, and this one is a fascinating exploration of the shifting aspects of the self explored in a variety of personas. Our third most recent text was The Turning by Maxine Chernoff. The Turning is probably the most overtly political book that we’ve published. We’d like to publish more, but few poets have Maxine’s gift for channeling political outrage into an intense exploration of the language.